The Internet is everywhere. Chat rooms and instant email messages have taken the place of letters and phone calls. The Internet has changed the way we do business, shop, communicate, and even meet people. In many ways our lives are easier and more convenient. But what price do we pay for this convenience? Habits of the High-Tech Heart addresses the major drawbacks to the network computerization of our society and the growing tendency to substitute technology and innovation for morality and virtue. Quentin Schultze argues that the cyber-revolution is a mythology of progress that is fueled by informationism, a quasi-religious faith that falsely assumes information itself can improve our lives. Cyberculture assumes a technical solution to every problem. It breeds individualism at the cost of community and values speed, efficiency, and convenience over quality, morality, and virtue. The solution, Schultze argues, is not to dismantle our growing technologies but to pay more attention to the "habits of the heart" as described by Alexis de Tocqueville and made popular by Robert Bellah and his colleagues in Habits of the Heart (discernment, moderation, wisdom, humility, authenticity, and diversity). These habits, which embody the wisdom of the past and the virtue and morality of the Judeo-Christian tradition, must reshape our understanding of digital technology. Greatly influenced by the insights of VAclav Havel, Schultze calls for a renewal of community and offers readers ways to live by habits of the heart in the information age. 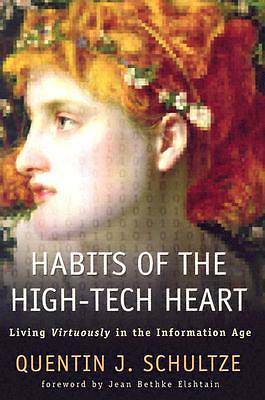 Habits of the High-Tech Heart is a provocative and engaging book that will foster dialogue among philosophers, theologians, technology experts, and all those concerned with the impact technology has had on our society. And while it is both comprehensive and scholarly, Habits of the High-Tech Heart is engaging and accessible enough for the thoughtful lay reader.